Stefan has become one of Australia’s most sought-after business speakers. Always lively and memorable, Stefan leaves audiences with an action plan, a clear vision and the confidence to make real business change. He offers useful and practical advice in an entertaining, informative and revealing package. Stefan Kazakis is the voice of reason. He’s a global business coach, a world-class keynote speaker and the owner of multiple businesses. 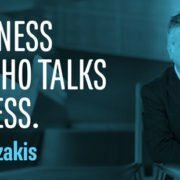 Unlike other business speakers who consult but don’t ‘do’, his knowledge and experience is based on hard-won lessons learnt from 25 years building and growing multi-million dollar businesses from the ground up. Stefan is renowned for putting his heart, energy and money on the table to build and grow successful businesses. He walks the talk. In short, what he has done for his own businesses, he does for others.